It was April 4th, 2010. Easter Sunday. I felt something in my gut that morning and, against all odds, my life changed in the blink of an eye. I’ve been fascinated with family history research since I was very young. My parents moved to Cleveland right before I was born and all of our extended family remained further east, in upstate NY and NJ. I grew fascinated by the notion of these other people who lived in mythical, far-off places with names like “Bergen County”. Genealogical research seemed to be a way to get to know them a bit. As I grew up, my theatre career took me right back to the east coast and, when I moved to New York in 2002, my first apartment was in Sunnyside, Queens. After giving Brooklyn and Manhattan a try, the end of 2009 found me moving back to Sunnyside. The beginning of 2010 was a rough stretch for me: a relationship had just ended, I was working very long hours, and I generally found myself in the middle of a major transition period. So Easter Sunday appeared out of nowhere and I relished in the rare opportunity to have a day without obligations, to just do whatever struck my fancy. It turned out to be the first really nice weather day of the year – the sun was out and I just had to get out of my apartment, so I walked myself over to a neighborhood diner and ordered some breakfast. As I was sitting there, reflecting, my mind went to an unexpected place: I started thinking about the massive cemetery that I had passed a few times while walking around the neighborhood, but had never taken the time to explore. I remembered a website called Find A Grave. I had explored it a bit, but was curious to learn more – and to possibly contribute to its volunteer-driven database. It seemed like the perfect day for some exploring. Find A Grave is a website that has existed since the mid-90s. The idea is, quite simply, to index and record information for all of the world’s cemeteries. It is a constantly-growing, user-driven compilation of information. Whereas gravesite information was previously only available by contacting the cemetery office (and, even that assumes you know in WHICH cemetery your ancestor is buried) with this website, members of the community-at-large can pool their resources and knowledge for the better good – creating a stronger, searchable resource for everyone. With thousands of volunteers throughout the globe, Find A Grave contributors help each other with content requests. Let’s say you have an ancestor who is buried in California, but you live 3,000 miles away in New York. You can post the information relevant to that ancestor’s gravesite and a kind, local stranger will eventually dispatch themselves to photograph the headstone so that you may see it and have a record of any genealogical information it may contain. For instance, knowing that my mom’s father is buried in Mahwah, NJ at Maryrest Cemetery – I recently found that a volunteer (who has no relationship to our family) had actually already photographed his headstone. You might see if any of your relatives are on the site – with over 93 million records, the odds are increasingly good. Anyway, I left the house to explore Calvary Cemetery – a gigantic cemetery for which there’s an entrance on 52nd Street and Queens Boulevard – in Woodside Queens. Armed with my camera, I proceeded to try and make sense out of the cemetery map that I had found online. The whole place seemed to be unending and gigantic, and – though I’m not usually overwhelmed by things like this – it was a bit overwhelming. As I entered the cemetery grounds I walked for at least an hour – taking photographs of random headstones here and there, and mostly just enjoying being around grass and trees within such a peaceful setting. 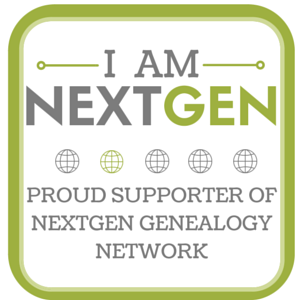 I brought two requests from the website with me – hoping that I would be able to fulfill some far-away genealogist’s photo requests and at least make a fleeting deposit into the karma bank for the day. The first gravesite took quite a hike, but once I got to the correct section of the cemetery, the grave was nowhere to be found. I looked all through the corresponding area, but still no dice. Perhaps it was written down wrong, or perhaps it’s a grave without a headstone. Either way, I was 0 for 1, and thought I might have better luck on the second task I had brought with me – so I proceeded to walk towards the other end of the cemetery, in search of Clementina and Gesuele Sica, a photograph of their headstone was being sought by a woman named Debbie. I saw that she had taken volunteer photographs for others on Find A Grave, and felt the least I could do would be to try and help her out. I made my way over to Section 43, and excitedly located the grave for Clementina and Gesuele Sica. I took some photographs from different angles – careful to capture all the information – but also paying attention to things like the angle of the sun, shadows, etc. Feeling as if I accomplished something, and aware that I had now been in the cemetery for almost two hours, I decided to head back home – though, admittedly, I was guessing a bit as to the direction in which I should walk. Having left no breadcrumbs for myself, I decided to trust my gut and see where it took me. I walked for a half-minute away from the Sica grave, and was still taking in many of the other headstones. Throughout the day, I would see familiar surnames and wonder if they were ancestors of my friends, or people with whom I went to college – and I pondered that, in fact, the likelihood was imminent that many of the graves I was passing were, in some way, connected to me. I found myself wondering if any of my relatives – distant or otherwise – might have made their way here, as a final resting place. But no amount of peaceful pondering could have prepared me for what happened next. For a moment, my heart stopped altogether. I was staring at my great-grandfather’s grave. Of my eight great grandparents, he’s the only one for whom I was never able to find a cemetery location. But there I was – shaking and awestruck – face to face with the headstone of my great-grandfather. Without his courage, our family would not be residing on this continent, let alone even be in existence. He led a hard life, with the hope that mine wouldn’t be as hard. And here he was, where he’d been for the last 60 years: 9 blocks from my apartment. I had a feeling that morning that going to the cemetery and photographing headstones was how I was supposed to spend my day. But this photo doesn’t do the place justice. It is massive. There are over three MILLION people buried in the four areas of the cemetery. I happened to go in search of a grave that was in the same ROW as my great-grandfather – the only ancestor I have who was even remotely likely to be buried here. 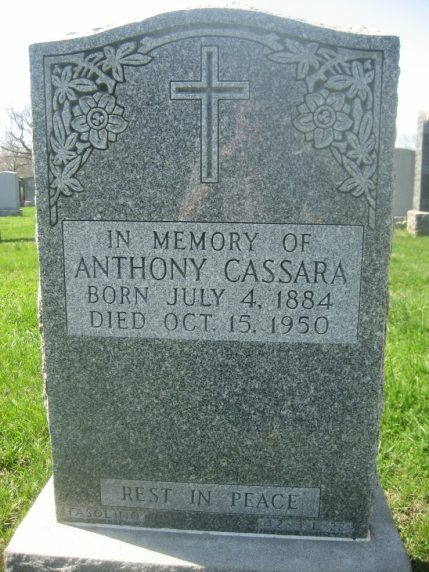 But, even though I realized that Calvary was a main destination for Italian and Irish Catholic immigrants to New York City, given overcrowded Manhattan’s lack of cemetery space, it never once crossed my mind that he could be buried there – and yet, there he was. There he is. Less than a minute’s walk from the headstone that I volunteered to photograph for a stranger from the internet. 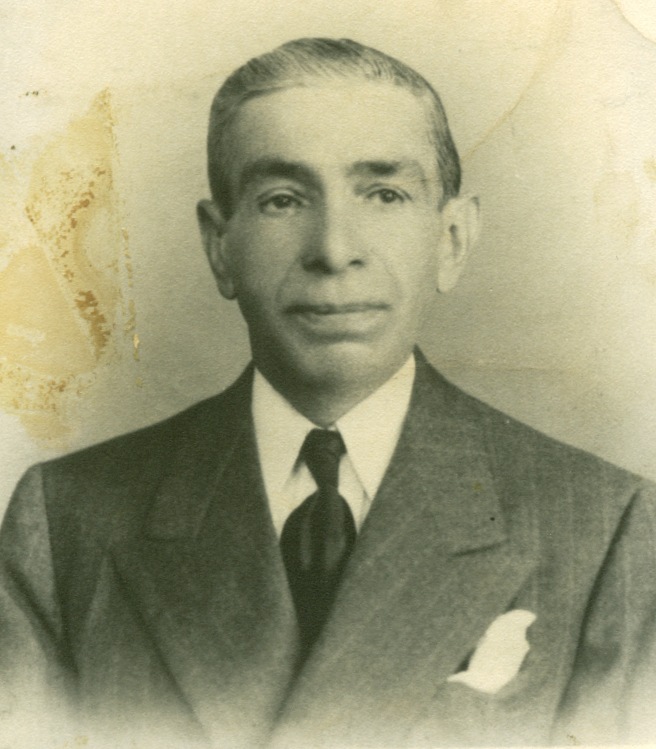 Antonino Cassara first came to the United States from his hometown of Mistretta, Sicilia, in 1907. By the beginning of the 1920′s, he was living in the coal-mining town of Mildred, Pennsylvania – with his wife Petrina (nee Lupica) and their ever-growing family – including their sons Joseph, Michael, John, and my grandfather, Salvatore Joseph – but everyone called him Sam. 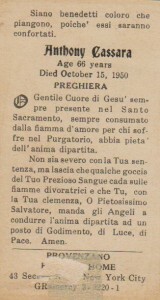 I knew Papa Sam well. He was a constant figure in my childhood. A couple of years before he died, I spent the summer with him and my grandmother in Rochester, NY. At my prolonged nagging, we finally took a trip to the cemetery where his mother was buried. Grandpa told me he hadn’t been there since she was buried – it had been almost 40 years. It’s the only time I ever remember him crying. He said “thank you for bringing me here”, we paid our respects, and we left. To this day, it’s one of the most vivid memories involving my family that I have. 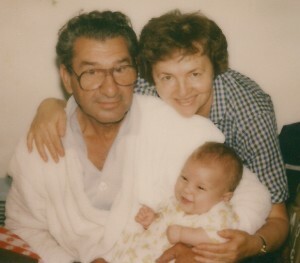 That was the day that my budding fascination with genealogy became less about names and places and facts and more about trying to understand the lives of those who have come before us. It became an intensely personal thing, and no longer a faceless attempt at gathering data. It’s almost been three years since that fateful day – and my passion for genealogical research is stronger now than it’s ever been. 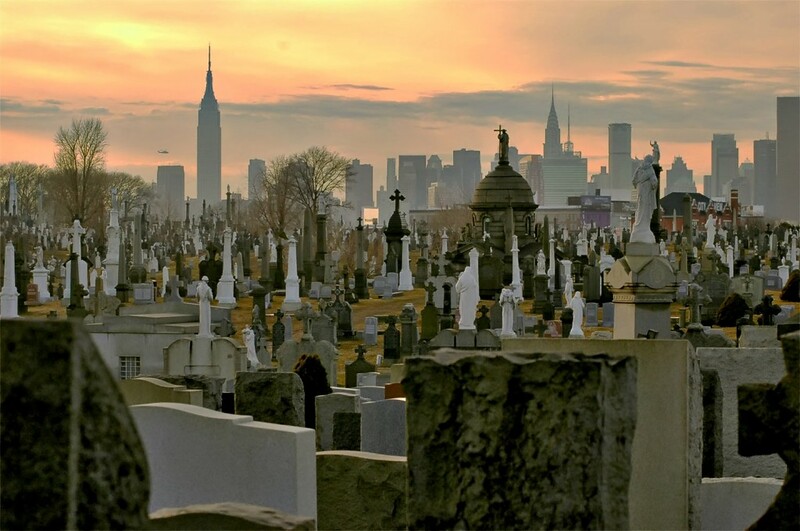 Since that first visit, I’ve spent countless hours in Calvary Cemetery and – while nothing has ever topped that remarkable experience – I’ve taken volunteer photographs for hundreds of researchers throughout the world. I’ve become a major contributor to the BillionGraves project and as of this moment have helped to add over 30,000 records to their ever-expanding collection. If I ever had any doubt, I learned to listen to my gut. I learned that serendipity exists. And I learned that, by honoring our past, we can shape our future.